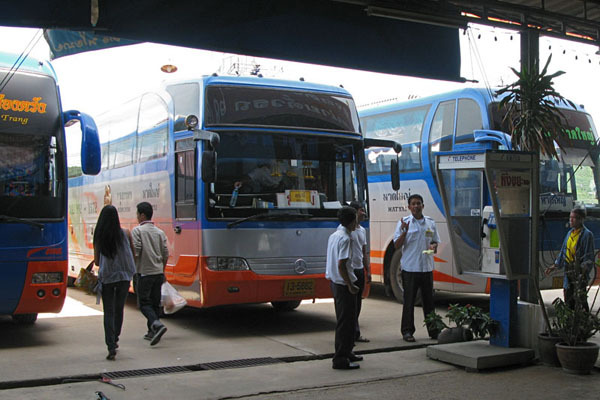 Instead of flying from Bangkok to Krabi, which would have cost 1,800baht/person ($56), we decided to take the 12 hour bus ride which was only 550baht/person ($17). 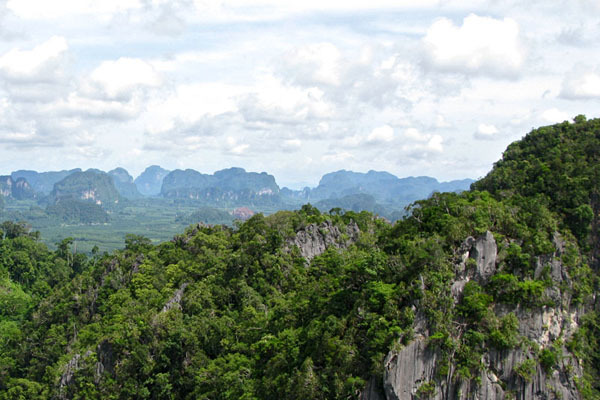 The cost was one advantage, but for me the big payback was watching the landscape of Thailand pass by. We saw hundreds of cows roaming freely, karsk mountains to the west, karsk mountains to the east, the Andaman Sea to the west, the Gulf of Thailand to the east, simple two room concrete block houses dotted the roadside, occasional lavish mansions by Thai standards, motorbikes zoomed passed, cities where bananas and durian fruit dominated the markets, rubber tree farms, thatch roofs protected from wind by bicycle tires and kids playing and dancing at the bus stops for the entertainment of the passengers. This my friends is the advantage of a road trip. We never could have seen any of this if we had taken a plane. AND it is more environmentally friendly. At this point in our lives, Nik and I have all the time in the world, so we are making the most of it by enjoying this place rather than rushing from one appointment to the next. The rest stop consisted of a large metal roof structure covering tables with snack foods, a couple hot food vendors and a restroom with squat toilets. Nothing fancy, but it was a good place to stretch our legs. This is a photo of our first casualty of the trip....Travel Scrabble. This Scrabble board has been part of Nik and I's relationship from day 1, literally. We played on our very first date back on April 6, 2006, and have been playing ever since. This board has gone with us on most of our trips for the past 2 years, and has made it to several of Nik's blog posts. You may even recall his largest victory ever where he scored 318 points in one game. 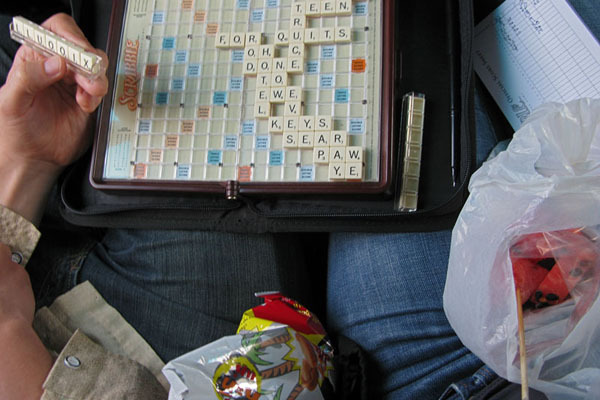 I am very sad to say that Travel Scrabble was left on the bus. We loved you very much, and I hope that someone in Thailand is enjoying this little bundle of joy that Alex donated to us when she left us for NYC. Upon arrival in Krabi, we had our first of many dinners at their Night Market. About 10 dinner carts dot a vacant concrete patch next to the river along with several metal folding tables. All of the menus are in Thai and English, so most of the farangs make it here eventually! 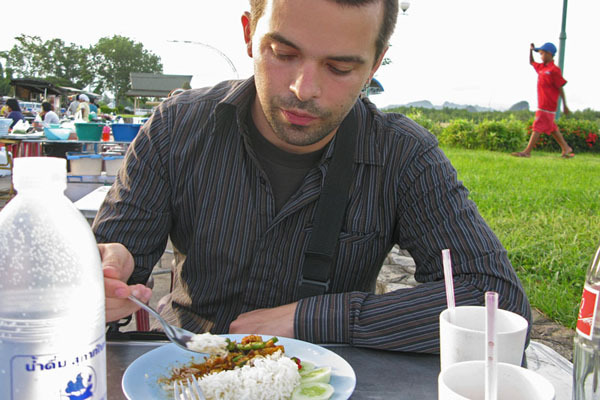 Nik eating Penang Curry with 5-baht water and a bottle of Coca Cola. 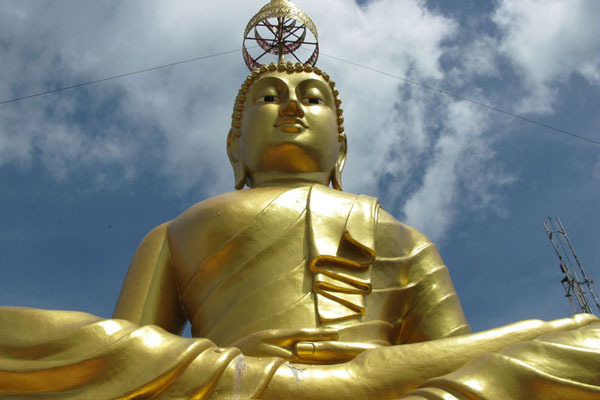 Our next adventure in Krabi was visiting Wat Tham Seua and climbing to the top of the adjacent mountain which is the home to one a large golden seated Buddha and a couple small alters. 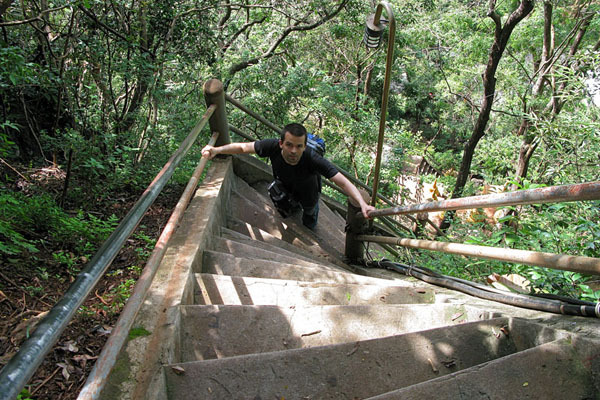 The climb was pretty rigorous with over 1200 steps…and these were not the typical 7″ steps. Several of them had to be over 15″ tall with only a 4″ tread. It was more like climbing a 1200 rung ladder! 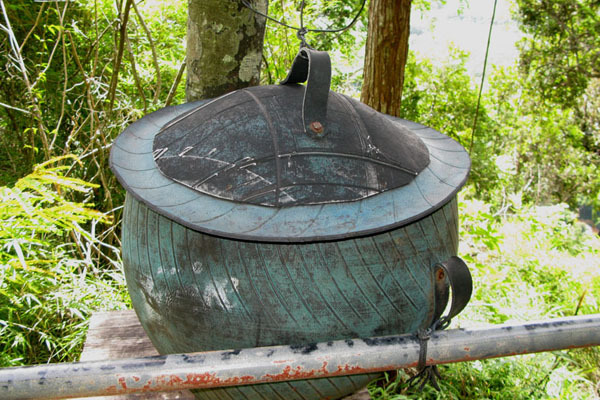 All around Thailand, they repurpose used automobile tires into trash bins. There were several along the hike up as well as near the beaches in Phi Phi. After we came back down the mountain, we went back to the guest house to change out of our sweaty clothes, then we came back to Wat Tham Seua so that we could visit with the monkeys!! Nik took several good photos, so take a look at his website. I was still worn out from the hike, so I rested with this little kitten. She was so adorable that I couldn’t resist petting her. She climbed right into my lap, and wouldn’t leave. Unfortunately, I am allergic to cats, so I ended up with puffy eyes for a couple days, but it was worth it. 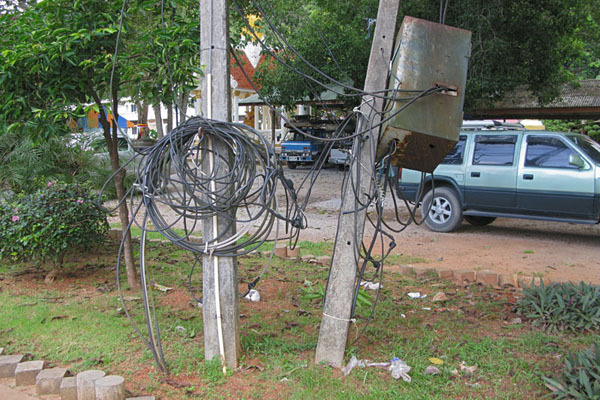 This happens to be at the base of the temple, but it is typical of all electrical wiring in Thailand. I don't know how people don't get electrocuted. 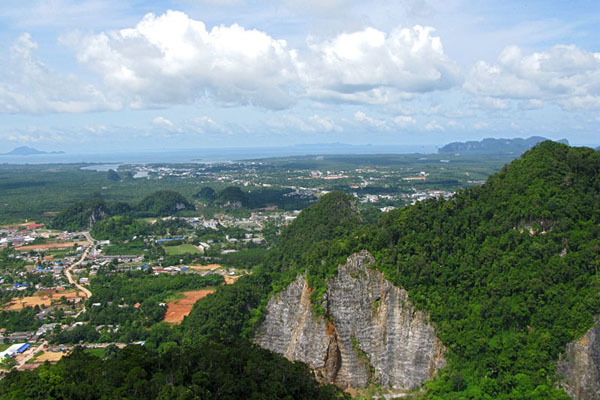 Then we took a short ride outside of Krabi. We were on the same roads we had traveled down yesterday on the bus, but it was so much nicer to be on the motorbike!! 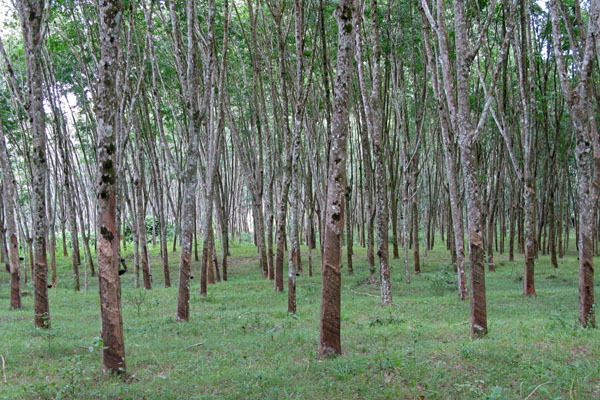 The neatest part for me was the rubber tree farms. 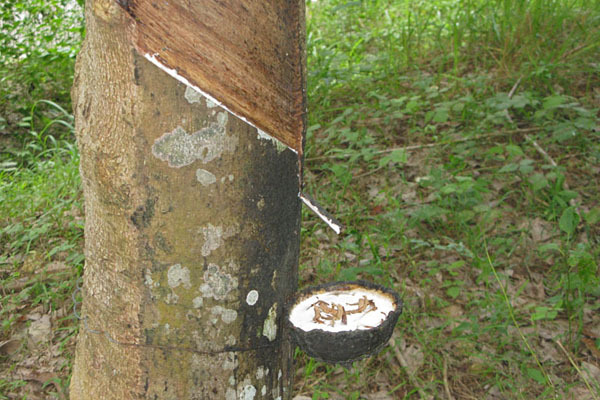 I have never seen one, so to watch white latex dripping from the trunk of a tree was pretty amazing!! 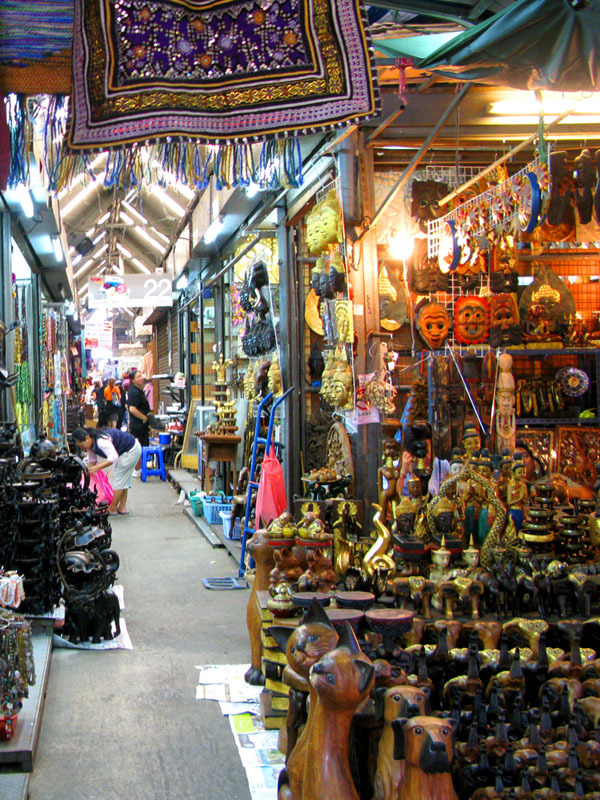 On our last day in Bangkok, we took a taxi north of town to the Chatuchak Weekend Market. 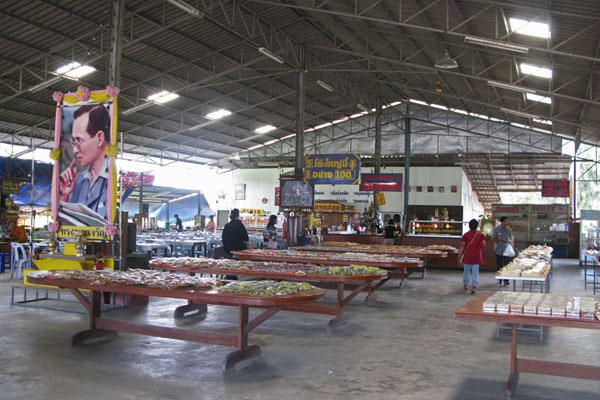 The market occurs every Saturday and Sunday, and is frequented by locals and farangs (thai for “foreigner”). 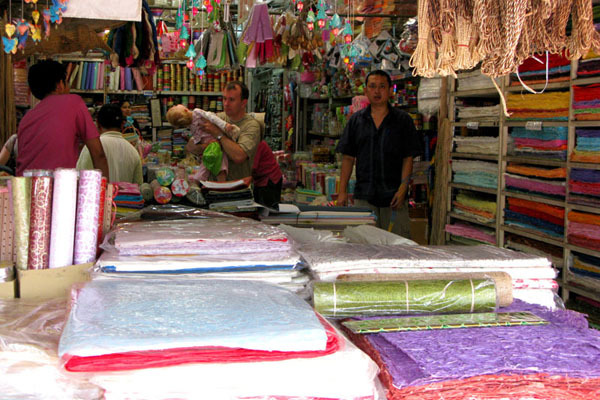 Over 9,000 individual booths including food, handicrafts, clothing (new and used), furniture, pet dogs, cats and lizards, books, towels, silk flowers….and the list goes on. So if you’re in the market for used Nike or Puma tennis shoes, a baby turtle and a new teak dining table, this is the place. 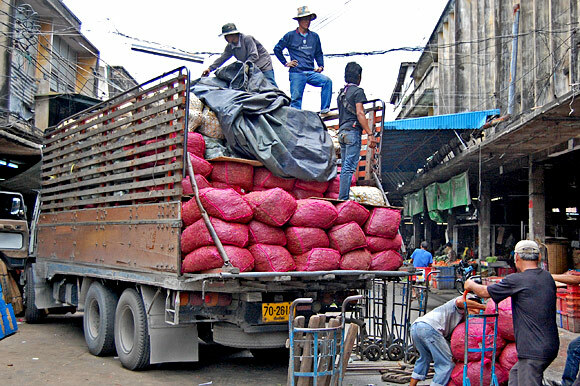 It is refreshing to see true examples of local markets thriving here in Thailand. I wish that we could say the same in America. Our flea markets are still going strong, and the farmers markets are picking up again. But the average purchases are made at shopping malls and big-box stores. I know that we will never get back to this, but I hope that we can all understand the market’s worth. At Chatuchak, the market is so huge that they had to set up a street grid with numbered "soi" or lanes, and they distribute printed maps. This reminds me of the huge antique malls that you find in America, or I suppose it is also similar to Ikea but cooler. There are a few blocks dedicated to books. 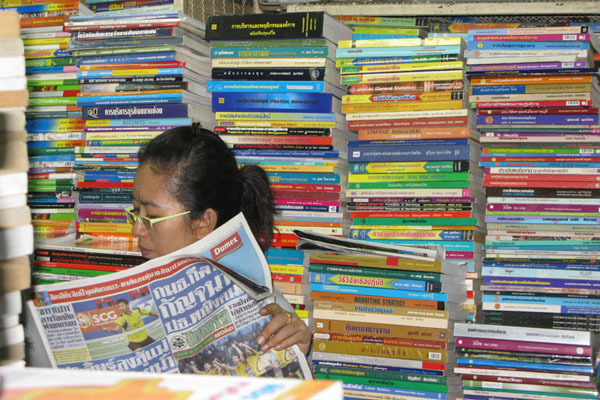 Most are in Thai, but they were still nice to look through even though I don't know how the shop owners find anything. 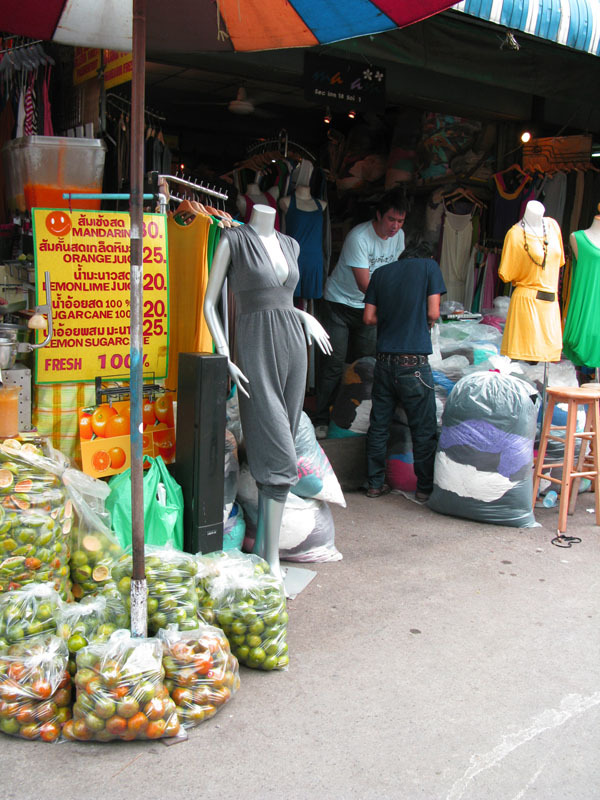 This manikin was sporting a sassy grey unitard as she hung out next to the Thai oranges. It looks cool in theory, but I don't know how anyone could pull it off!! 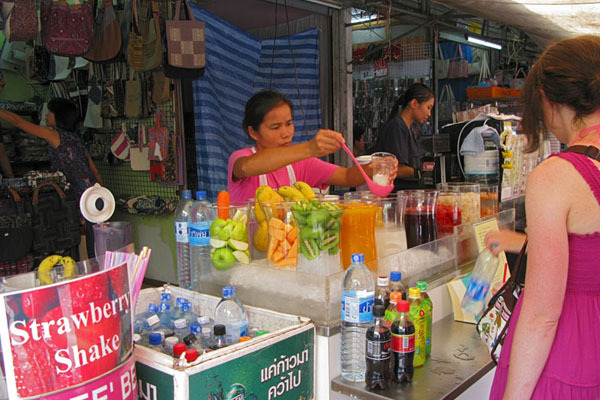 The best thing about Thai Markets (other than the clothes, housewares, shoes, people watching, jewelry, fabric, books and handbags) is the food. Here you see a young lady serving up delicious fruit shakes. Banana is the best!! I can report that I mostly refrained from buying anything. I walked away with a zebra print beach towel and a Thailand flag patch to add to my growing collection of country patches. I was tempted by fabric, clothing, dishes and jewelry, but we are still in the travel-every-other-day mode, so it was impractical….and I am on a frugal vacation. Is that an oxymoron? ps. I looked for the silver beads a friend had requested. I haven’t found them yet, but Chiang Mai is supposed to be the silver mecca of Thailand, so hopefully I’ll have better luck there. 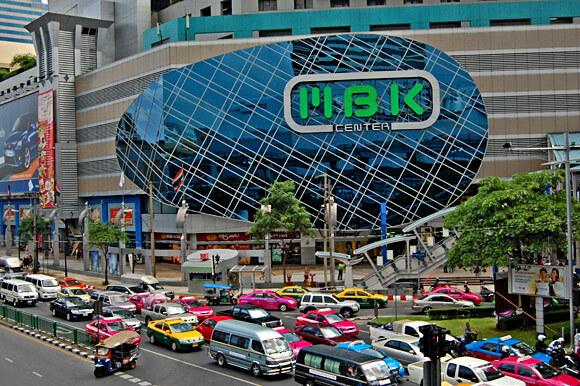 Yesterday we spent the day at Siam Square and MBK which are the big, rather, huge shopping malls in Bangkok. …Rewind…yesterday morning we went to Chinatown again, but saw the REAL Chinatown. It was very nice but kind of smelly. There was an entire street dedicated to shoes, and several of them were only $3-5. Traffic was crazy and we were always in the way. Oh yeah, we were at the market at 6:30am. I know. Too early. But we were working out the remnants of jet lag. So back to the malls. We arrived @ 8:30, but it didn’t open until 10 so we wandered outside people watching. The dress(code) out in that area is drastically different than the older areas near the guest house. Everyone at the mall was stylish and modern, which made me very self conscious. I had also worn the wrong shoes for a day of shopping. My feet were killing me after an hour, so by the end of the day I could barely walk. We spent the entire day at the mall only to discover that we had missed nearly half of it. Oh well. **Cool Store: Loft – designy bags, containers, dishes, etc. Afterwards, we met up with A., one of V’s friends from college. He was super nice and took us to dinner at Cabbages and Condoms. Decent, but not great food. Then we went to a coffee shop called Elefin’s for Lemon Icees. They were a great counter to the sweltering heat. The most interesting part of last night other than the company, was the area. 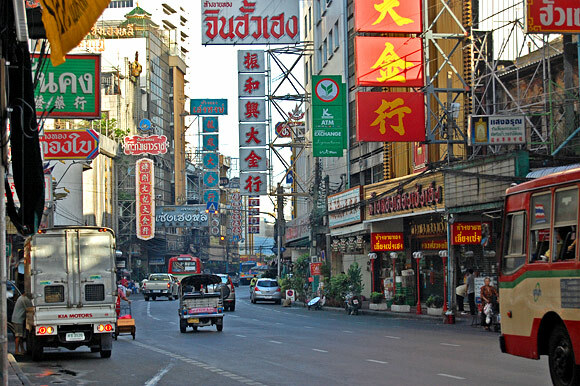 The Sukhumvit part of Bangkok is completely different than the Banglamphu/Thewet area. 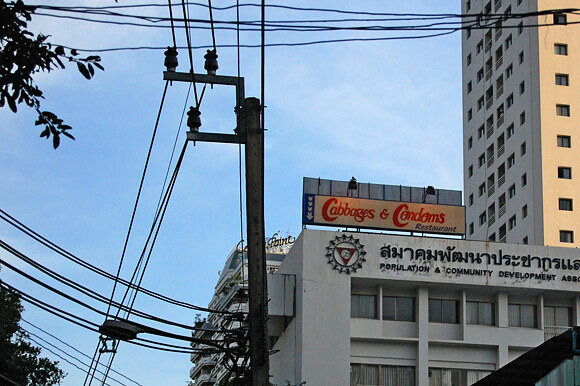 Sukhumvit is where all of the American and European businessmen stay when they are here. We supposedly walked through part of the red light district, which comprised of several outdoor bars where young dolled-up Thai girls would meet older, wealthier white men. The concept disgusts me because you know that these men would never do this in America. Or maybe they would, I’ll hopefully never know.